This common name refers to only one species. These are pretty much always called Giant Salmonfly. This is the West's most legendary hatch. Anglers from all over the world make pilgrimages to the region's rivers in the hope of catching large trout surface feeding on these giant insects. Those fortunate enough to hit it right will have an awe-inspiring experience, regardless of their fishing luck. In cycles of plenty their numbers are truly astounding. They make up a large percentage of the biomass and this large lumbering grazer has had its niche likened to the huge herds of bison that once roamed the plains and foothills their rivers flow through. The hatch progresses upriver quickly, with adults being in the air or on the water for a given stretch only a few days or so. For reasons not fully understood, the nymphs prefer certain locations over others for "staging" prior to the hatch. An angler can stand on shore and notice very few of them while 50 yards up or down the rocks and bushes can be crawling. Competent guides and astute locals are aware of these locations and often fish them "in front of the hatch" for spectacular nymph fishing. An added bonus is they are also "in front of the crowds." Visiting anglers would do well to fish upriver of the latest angling reports. 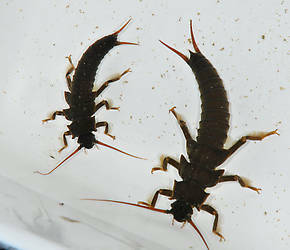 Fishing water based on "yesterday's news" often leads to seeing more anglers than salmonflies. Pteronarcys californica (Giant Salmonfly) Stonefly Nymph View 2 PicturesHere are two size classes of Pteronarcys nymphs. These probably represent two different generations. The largest will probably emerge next spring and the other in two years. There is probably another generation, smaller, I did not collect. In a Canadian study they discovered Pteronarcys eggs do not all hatch simultaneously but hatch for a period of nearly two years, making their egg/nymphal life 5 years. The other photo is of a curled nymph, a typical response to disturbance. 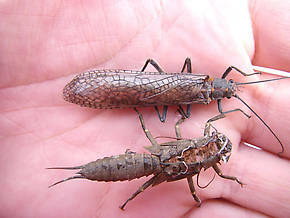 Male Pteronarcys californica (Giant Salmonfly) Stonefly Adult View 1 PicturesThis shows the adult and its exuviae.